Another laser strike at an aircraft out of Oakland International Airport was reported Tuesday, a day after the airport received four reports of lasers being pointed at aircraft, according to the California Highway Patrol. "As airplanes were landing, someone was pointing a laser at the aircraft at the Oakland airport," CHP Officer Shaun Bouyey said. The CHP said the latest laser incident happened at 5:45 p.m. Tuesday. Aviation expert Mike McCarron said a laser beam remains tight and can come through a cockpit with intensity, temporarily blinding the pilot. "The pilots at that point have night vision," McCarrron said. "Their eyes are extremely sensitive to light; they haven't seen any bright lights for the entire length of the flight, basically. It's like walking from a dark room and getting a flashlight aimed at your face." McCarron said it can take 20 to 30 minutes for a pilot's eyes to readjust, putting the pilots and the passengers in jeopardy. 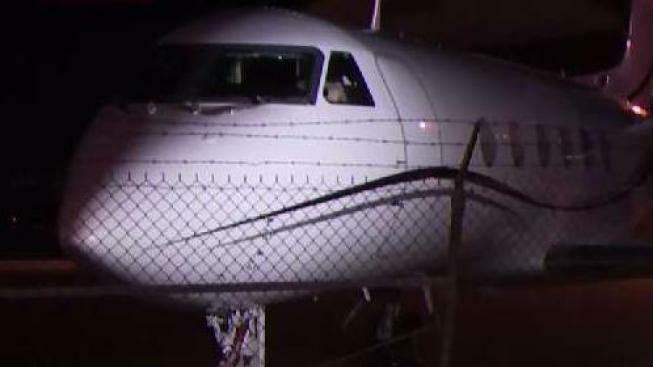 The aircraft that reported having lasers pointed at them Monday night were either charter or private flights, not commercial flights, according to the airport. Two reports were called in around 5:51 p.m. while two more reports were received around 10 p.m.
One of the reports indicated that a laser was coming from a location near 98th Avenue and Interstate 880. Laser pointers were previously flashed at vehicles and aircraft during an illegal sideshow in Oakland on Friday night. It is not clear if Tuesday's incidents were linked to a sideshow.